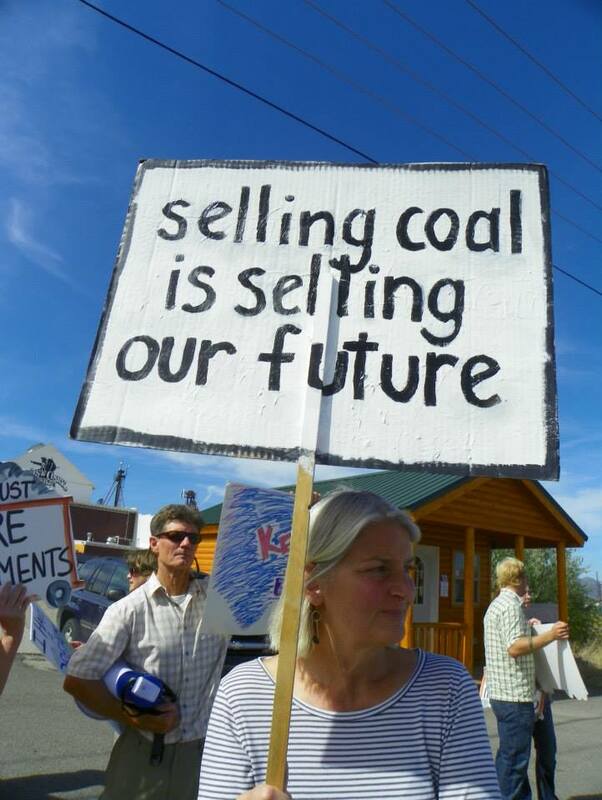 2013 was a big year for the movement to stop Montana coal exports. In 2013, the Montana Department of Environmental Quality held its public scoping comment period on Arch Coal’s proposed Otter Creek Mine. In a temporary victory for communities affected by coal pollution, the DEQ determined Arch’s application was deficient, meaning Arch has to submit more information before the review process moves forward. Meanwhile, those of us fighting coal exports took our organizing to new levels. Communities in Eastern Montana have been fighting coal projects like the Otter Creek Mine for decades, and you can read about some of their victories here. Since it’s become crystal clear that mines like Otter Creek are meant to supply West Coast exports, rail towns in Western Montana are joining the fight, too. 2,000 comments delivered. Early in 2013, during the DEQ’s public “scoping” period on the Otter Creek Mine, Blue Skies and our partners delivered over 2,000 comments in person to the DEQ office in Helena. Many comments specifically urged the DEQ to consider wide-ranging impacts from coal export mining, like coal train pollution and climate change, in the Environmental Impact Statement for Otter Creek. Standing up for public health. In March, more than twenty Montana physicians and health professionals sent letters to the DEQ, requesting a study on health effects of pollution from coal train traffic. Montana physicians are sending a message that these concerns must be heard in the Otter Creek review process. Read more here. Small businesses speak out. Blue Skies volunteers in Missoula canvassed small businesses, sparking dialogues with business owners and resulting in twenty businesses signing onto a letter opposing coal export mining. Increased traffic congestion, healthcare costs from pollution, and reduced quality of life will affect local economies if coal export plans go through, giving local businesses a real stake in this fight. Pressuring coal’s investors. In 2013, Blue Skies grew our campaign to pressure candy billionaire Forrest Mars, Jr. over his investment in coal exports. In March, we coordinated a national day of action against Mars candy, with actions in eight different states. The following month, we took our message to Mars Inc headquarters in Virginia. We’re keeping the pressure on to get Mars candy money out of coal; get involved here. September Showdown Against Coal Exports. Building a bolder movement. Our boldest 2013 action of all came on September 15th, when fourteen people stepped into a railroad right-of-way in Helena and peacefully shut down the main rail line used to transport Montana coal to the West Coast. A first-of-its-kind action for Montana, our sit-in on the rail line sent a strong message to decision makers that if coal export mines move forward, Montanans are ready to put our bodies on the line to stop more coal trains from reaching the West Coast. Find out what happened at the September Showdown Against Coal Exports.